Ever bought a really disappointing mascara? Or an eye shadow that looked so intense in the pan but had to be broken to get any pigment out? Had a nail varnish that took five coats to get any intensity? Or what about that foundation that matched so well in the store but looked so orange in the real light? Do you, like me, have these products sat at the bottom of your make-up kit “just in case”… well, here is your chance to get rid of it and feel good about it! Illamasqua counters all over the UK and Ireland are offering you the chance to ditch the make-up drudgery and embrace the extraordinary. 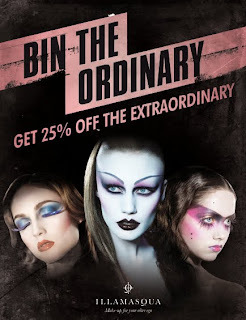 Bring in ANY make-up product [be it low end, high end drug store…] and we will take it off your hands and present you with 25% off ANY Illamasqua product in return. So, if you fancy a new Nail Varnish and have a broken palette at home that you don’t know what to do with [but you spent £35 on it and feel guilty just throwing it away…] then bring it to us and we will dispose of it for you whilst giving you that 25% off your new Nail Varnish. There is no limit to how many pieces you can bring and it can be in any condition – falling apart, smashed, nearly empty, dried up… we want to help you start again! Our highly skilled, professional make-up artists will be able to talk you through the collection and show you what products would be right for you. They will help you develop your own skills and encourage you to reveal your alter ego with our exciting palette of professional products. This event is only taking place at our counters within the UK and Ireland, and not online or in any of our international stores.